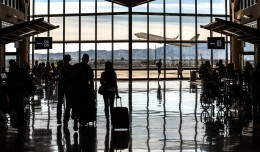 1) When booking a plane ticket, always confirm the destination is where you actually intend to go. 2) When you are told by police that they will arrest you if you don’t leave the aircraft, they are not bluffing. These pointers would have been very useful for a woman on board a US Airways flight from Philadelphia to Lisbon, Portugal, who became irate that the aircraft was not going to Brazil. Could it be, since both countries speak Portuguese, that she Googled “Portuguese capital” and booked whatever the results showed? After upsetting passengers with her profanity and refusing to leave the aircraft, police were summoned. She still refused to leave, expecting to be flown to Brazil as if the error were the airline’s fault, and she was forcibly removed. The flight was from Philadelphia to Lisbon, where I am now. It was US Airways Flight 738. We were about 45 minutes delayed to start with, then we boarded, and this woman passed me yelling about how we weren’t going to Brazil – that we were going to Portugal (I’m assuming this is because they were speaking Portuguese on the flight, also native to Brazil). She was being very loud, swearing. Overall, you could sense that people didn’t feel comfortable around her. I’m assuming that a few people must have mentioned to the flight attendant that this woman was being irrational and acting strange, there were children on the flight and some nasty words were being thrown around. Next thing I know there’s a police officer standing next to me in the isle (where I’m filming from) and this woman begins to raise her voice more and more while a flight attendant tells her to calm down. I captured the rest on video. She then was taken off the plane in handcuffs and we could see her being put into a cop car outside of our windows. This was all around 9PM on Sunday night, when our flight was scheduled to leave. We were delayed another hour, I put it on Reddit not expecting anything to come of it, and now it’s going viral. They had the passengers who were seated near her move to the area I was seated in and stand in the isle/sit in vacant seats until they dealt with her. My flight was delayed 45 minutes to begin with (originally leaving at 8:45PM) but this happened during boarding, and it caused an extra hour delay so we didn’t leave until around 10:15PM. The entire confrontation between her sitting down and being rude and obnoxious to the flight attendant approaching her to them taking her off the plane was about 20 minutes, give or take. Hopefully her cellmate is a geography teacher. 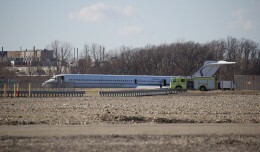 A chartered Ameristar MD-83 carrying the Michigan men's basketball team overran the runway at Willow Run Airport yesterday. Here are the current facts regarding the accident. Imagine being a seasoned flier with hundreds of flights under your belt and then suddenly finding yourself onboard and terrified. It can, and does, happen. 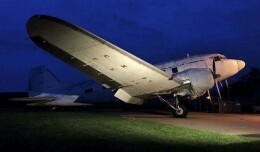 In a small town 30 minutes outside of Canton, Ohio sits a vintage C-53. If one airline pilot can't raise the money to save it soon, it will meet the scrapper. As a new presidential administration prepares to take over, questions loom regarding the future of how the FAA will control the nation's aviation infrastructure. 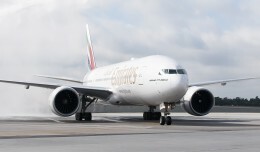 Dubai-based Emirates Airline added their 11th destination in the US on Thursday with the opening of the Dubai-Fort Lauderdale route. I’m in flight school in Thunder Bay up in Northern Ontario and one of United’s flight attendants had picked up the Chicago to Thunder Bay route last minute thinking she was going to the tropics… it was -40 when she landed.